Democratic US lawmakers Wednesday unveiled legislation to restore so-called "net neutrality" rules requiring internet providers to treat all online traffic equally. The bill, if adopted, would nullify regulations adopted in 2017 and restore the framework created in 2015, in the latest back-and-forth over the contentious internet issue that has been debated for over a decade. 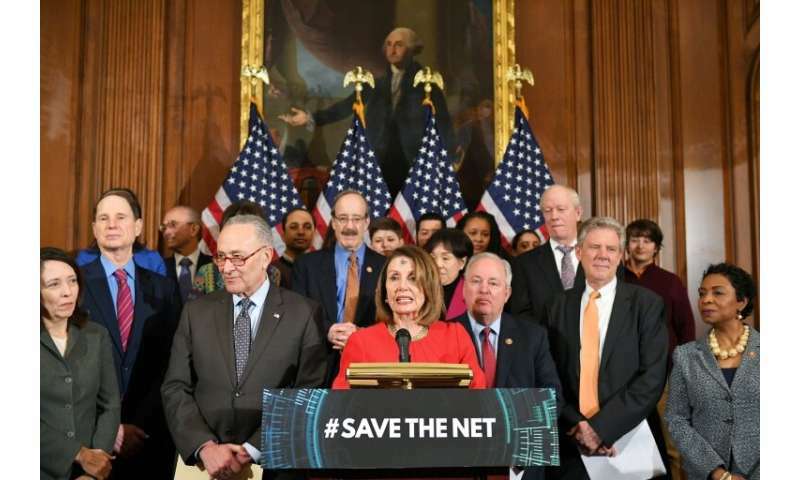 House Speaker Nancy Pelosi, flanked by Democrats from both the Senate and House, told a news conference the measure would seek to "stop unjust, discriminatory practices" of broadband firms. "A free and open internet is a pillar of so many things," she said. Net neutrality backers argue that clear rules are needed to prevent internet service providers from blocking or throttling services or websites for competitive reasons. Some activists fear internet service providers will seek to extract higher fees from heavy data users, like Netflix or other streaming services, and steer consumers to their own offerings or those of paying partners. Critics of net neutrality counter that the rules could stifle investment and innovation, and claim the internet is not designed for utility-style regulation from the 1930s. The Federal Communications Commission in 2017, headed by President Donald Trump's appointee Ajit Pai, adopted on a 3-2 vote rules ending neutrality protections. Previously, the FCC passed net neutrality rules struck down by the courts, before adopting a new measure in 2015 that classified internet providers as utilities, which was affirmed in court. Senator Chuck Schumer said Democrats acted on "grassroots" support for reversing the "horrible decision" by the FCC two years ago. "Average Americans understand they do not want the costs of the internet to go up," Schumer told the news conference. "If they start a business they want to be on the same playing field as the big boys." Chris Lewis of the consumer group Public Knowledge welcomed the proposal, saying: "Activists of all political stripes and small content creators rely on these rules to have a fair chance to reach their audience online without paying extra to deliver content. " Opposing the measure, Doug Brake of the Information Technology and Innovation Foundation, a think tank specializing in tech issues, said the proposal is an example of regulatory "overreach" and called for compromise. The bill "doesn't offer the balance a complex new platform like the internet deserves," Brake said. "It would be far better for Congress to thoughtfully design a new section of the law tailor-made for the competitive dynamics of today's broadband market."